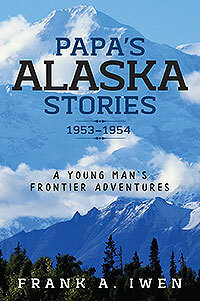 Papa’s Alaska Stories is about the young author and his adventures as an enforcement patrolman and a stream guard (a fish cop) with the U. S. Fish and Wildlife Service. Post WWII Alaska, still a territory, was already experiencing change and rapid growth. 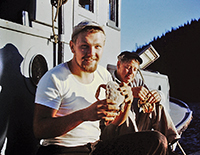 Iwen’s stories center around Alaska’s commercial salmon fishery during the summer of 1953 and 1954. His tales of being lost at sea, living in isolation, and encounters with bears are punctuated with natural history and ecological information. The book closes with an environmental commentary. Frank Iwen is a retired curator of birds and mammals at the University of Wisconsin Zoological Museum, Madison. He is a life member of the American Society of Mammalogists and The Wildlife Society. Studies have taken him from the Alaskan arctic to Argentina and many places between. Among his contributions to the scientific literature is his article about the Arctic Ground Squirrel (Spermophilus parryii) in The Smithsonian Book of North American Mammals (1999). He is also a retired Colonel of the U. S. Army Medical Service Corps. Mr. Iwen currently resides at his home in Madison, WI.